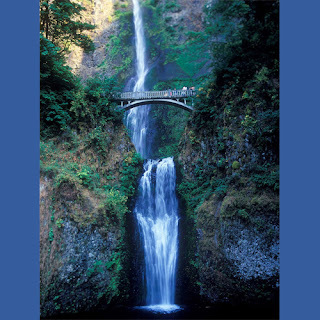 TRAVEL COLUMBIA RIVER GORGE: Take a Day Trip to Multnomah Falls! A perfect day get-away, Multnomah Falls lodge offers a perfect place to enjoy one of Oregon's most famous natural features. If you've never been to the falls, it is worth taking the time to explore the 620 foot falls, which is the second tallest waterfall in the nation. After your hike, pay a visit the the Forest Service Interpretive Center, grab a coffee, or enjoy an up-scale meal-- featuring fresh Northwest cuisine--at the Lodge. At the base of Multnomah Falls, the Historic Multnomah Falls Lodge awaits to offer a place of relaxation, a fine meal, the perfect gift, hiking or visitor information, or possibly an espresso or tasty treat to accompany your hike or day trip. Multnomah Falls offers a very popular 1/4 mile short hike to the Benson Bridge. Many Hikers with a little more time and hiking ability opt to continue to conquer the 1.1-mile trek to the top. The Multnomah Falls trail is paved from the base to the viewing platform at the top. The Multnomah Falls trail also connects with several other gorge trails, offering many different hiking opportunities accommodating a wide variety of time schedules and hiking skill levels. Information about the different hiking trails accessed from the Multnomah Falls Trail, can be obtained at the Forest Service Interpretive center. The information center is located at the east end of the Lodge. Detailed trail maps of the Columbia River Gorge are available for purchase online or onsite through the Multnomah Falls Lodge gift shop.